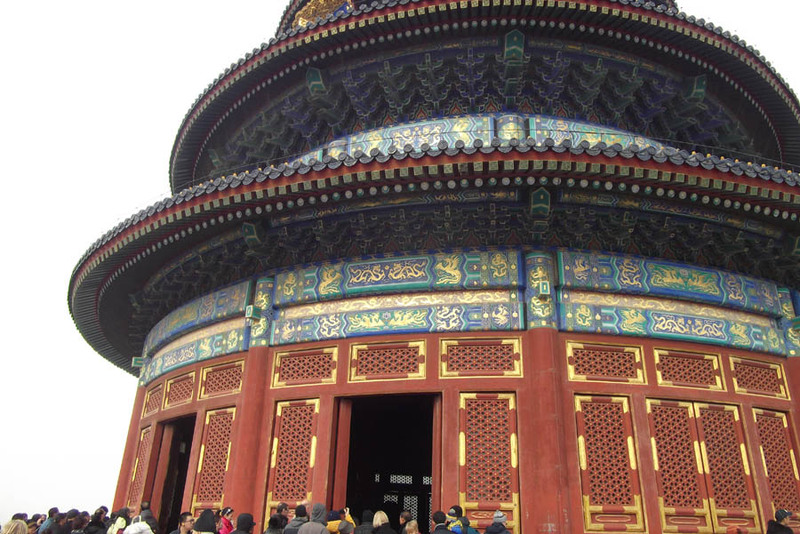 Our last day began with a trip to the Temple of Heaven, a large pagoda. 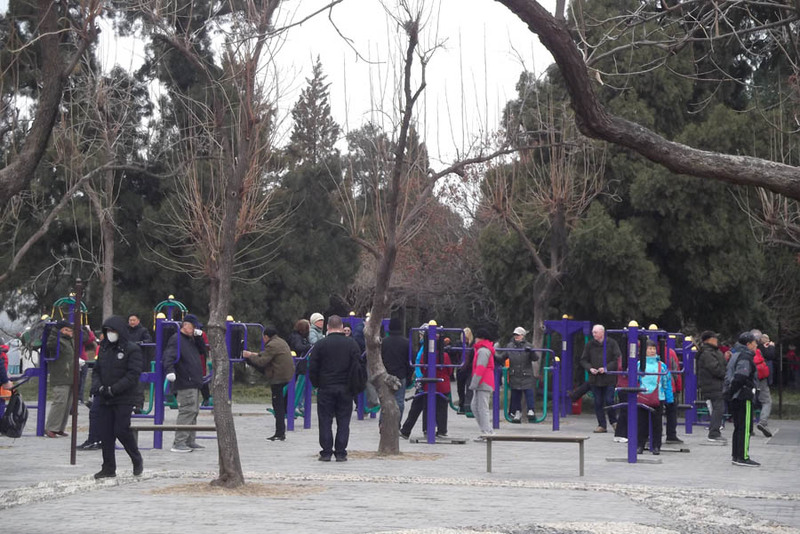 The bus dropped us as near as possible – parking is very difficult in Beijing – and we walked through an adult exercise park. Retired people could get cheap season tickets; it was quite a community gathering. Further in, groups of elders played cards and board games with great excitement, and a small choir practised in the park. The ‘maybe later’ marketeers added ping pong bats and feathered shuttlecocks to their repertoire here. This Temple has been used since Neolithic times, to hold sacrifices for a good harvest. Bamboo scrolls and brass compasses on sale here may hint at record keeping and feng shui functions too, but we couldn’t understand much of the information. The artwork was marvellous though. 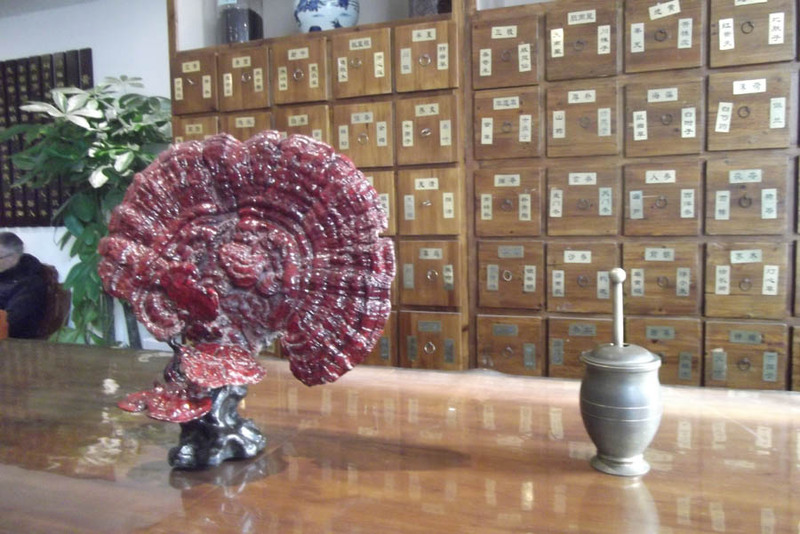 We scrambled back on to the bus before its parking time expired and stopped off at the Chinese Medicine Academy for a foot massage. This was partly to give their students practise and partly in the hope we’d buy something. If you want to take Chinese medicines out of the country, you need a certificate from the prescribing doctor. 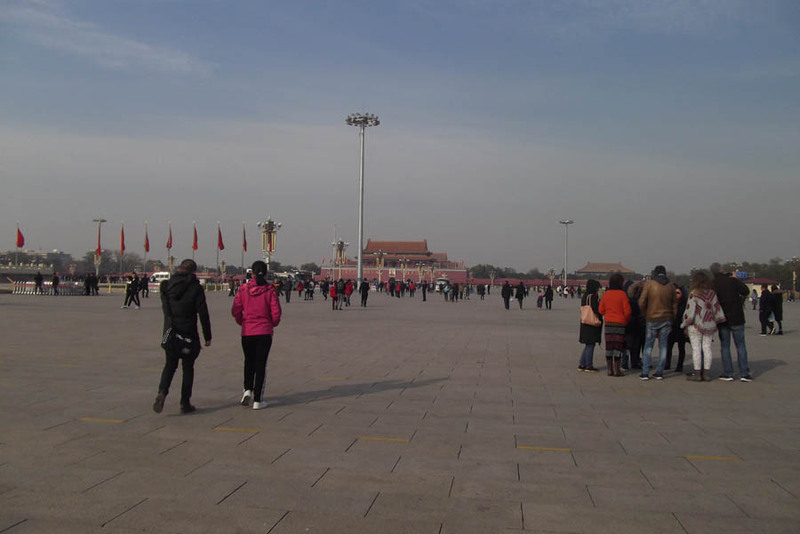 Finally we arrived at Tiananmen Square. It was smaller than Linda had expected, and less crowded than I’d thought. There were red flags, neat soldiers and police, impressive buildings all around. 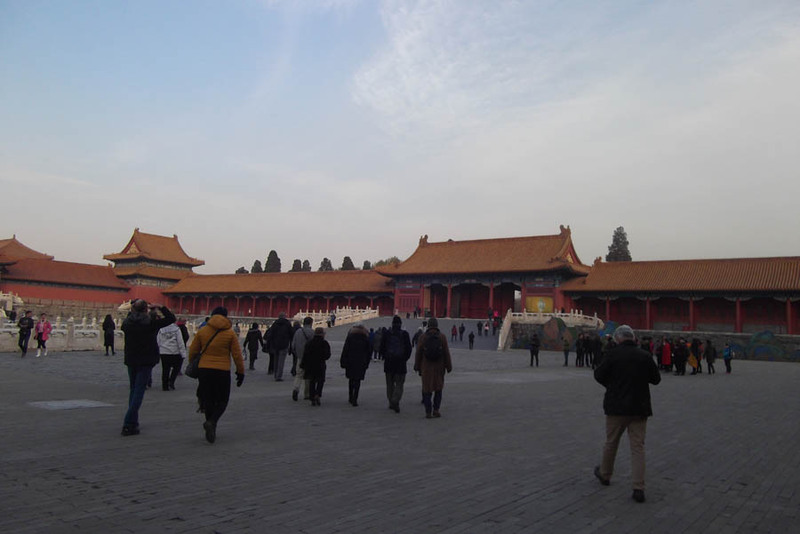 From there, we entered the Forbidden City at last. It’s vast; the guides warned us to keep up with the flag, as we had a lot of ground to cover, and the bus was meeting us at the far end. The courtyards were huge. I could imagine the officials waiting in throngs for their instructions, standing in the cold dry wind. I hoped they let them go inside if it snowed! Our guide lectured us on the various structures, their purpose and history. 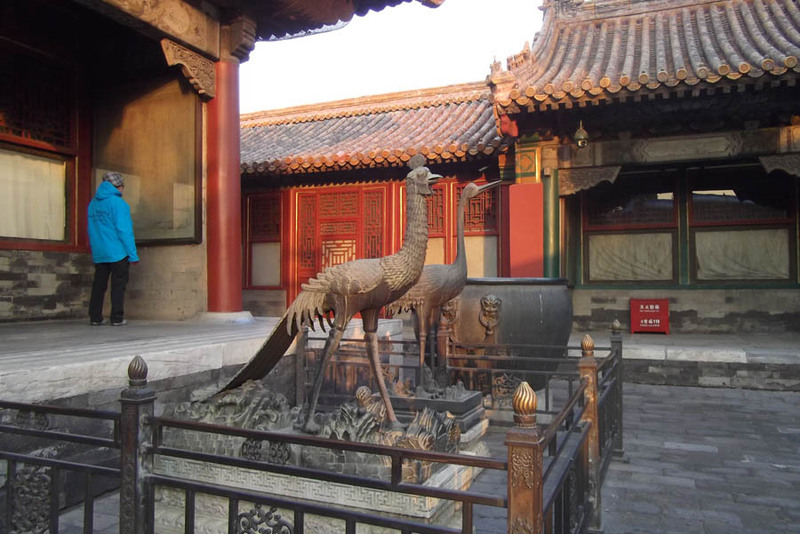 The roof decorations on the pavillions represented the Emperor riding on a rooster followed by nine dragons; this was considered to be a fortunate emblem. 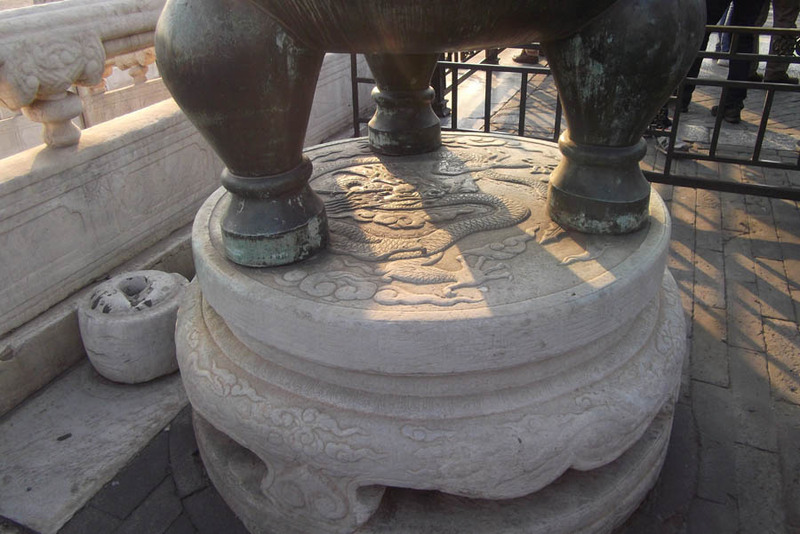 There were a number of large metal cauldrons throughout the city. These were for firefighting; charcoal could be lit under them so they didn’t freeze in winter. 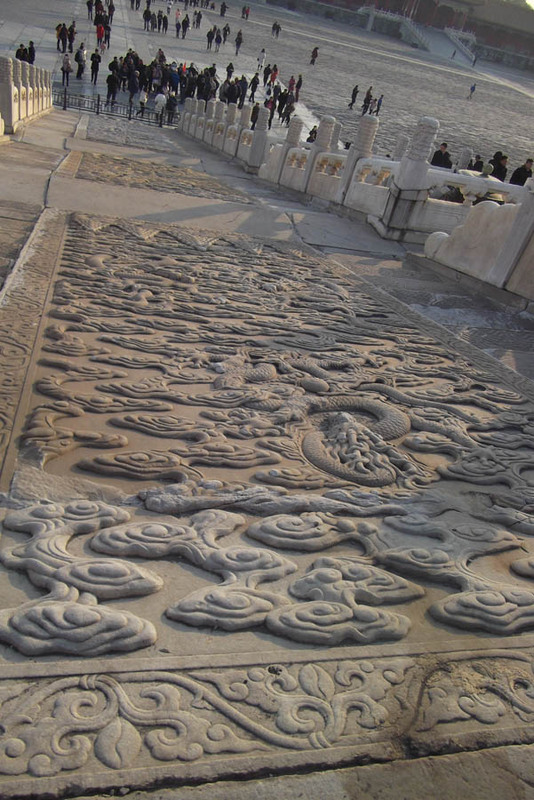 Their stone stands, and most other surfaces, banisters and doorways were all intricately carved, often with a dragon motif. 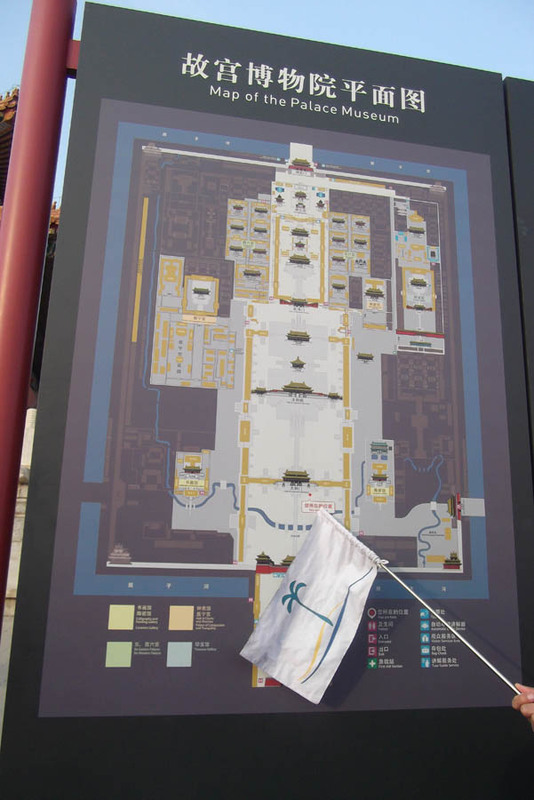 We crossed the second large courtyard, Harmony Square, and climbed the steps to the Palace of the Supreme Harmony, where the Dragon Throne sits. The prospect of actually setting eyes on this legendary artefact had excited me more than anything else about the trip! Tourists weren’t allowed to enter this palace, but you could join the small crowd around the doorways to view the Throne inside, and take a picture obstructed by a pillar. Already used to the rules about not photographing the Buddha statues, I didn’t see this as an imposition. Given the effort required only a few decades ago to get this close, I felt a short glimpse was enough of a privilege! 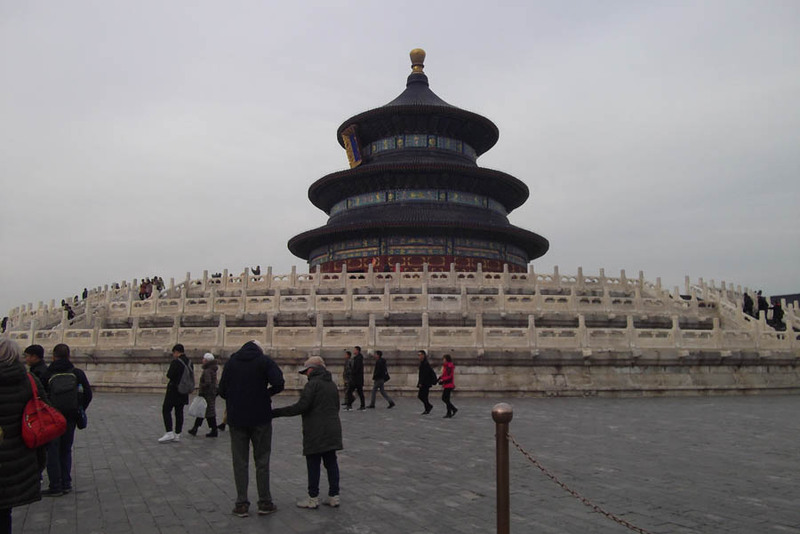 There were many Chinese tourists patiently waiting for their turn, so we didn’t linger. 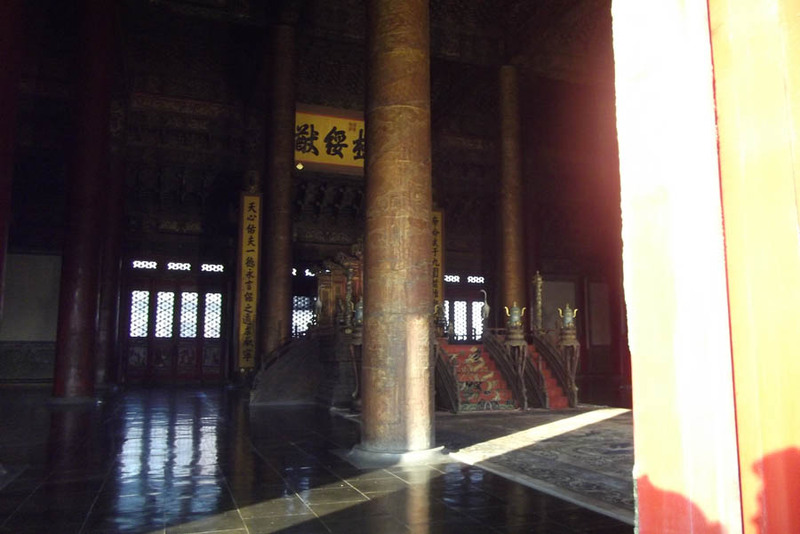 We had a better view of the metal ball hanging over the throne, which falls on any would-be usurper. It’s said that some Emperors shifted their seat a little to the side! 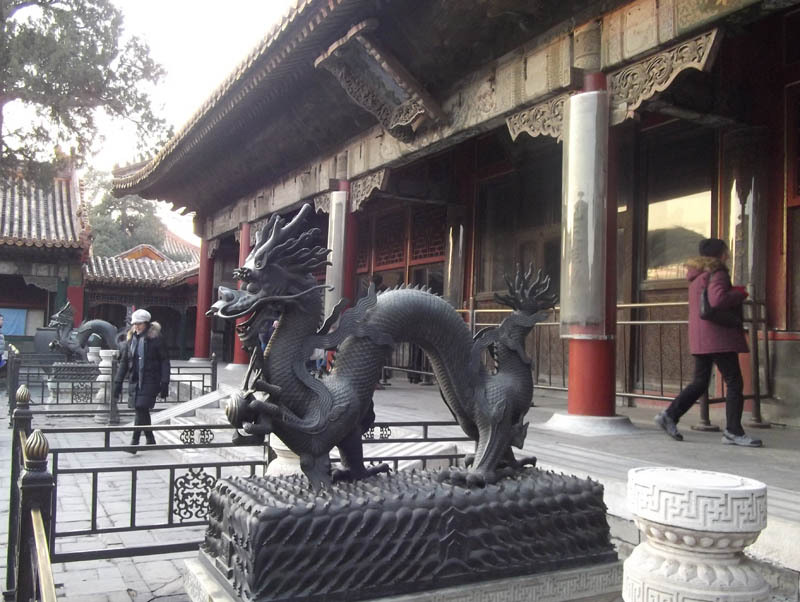 We turned off to the side through the next courtyard, to view the charming Western Palaces. 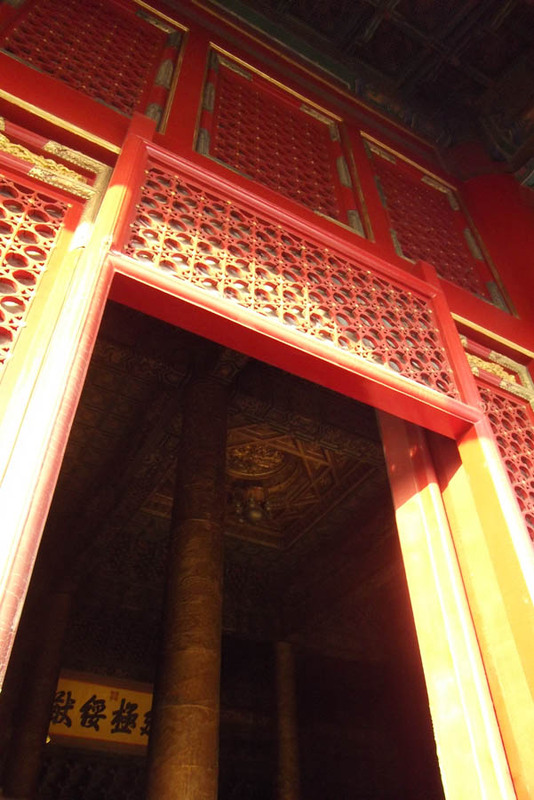 These used to accommodate the second wives and concubines of the Emperor, including the Empress Cixi. A long alleyway linked a number of little courtyards surrounded by wooden houses, which now hosted various exhibitions. Time was pressing, the light was failing. There were many more exhibits. Some, like the clocks and jewellery were extra; however the ticket office was closed by the time we got there. To really see a place this vast and historical, you’d need a full day and a guide book. Dusk was falling on our last day in China. As we reached the Imperial Gardens, we had to hurry. Loud music began to sound, like a scene from ‘Inception’. Barriers were coming down around us, our group had to look sharp not to be separated. 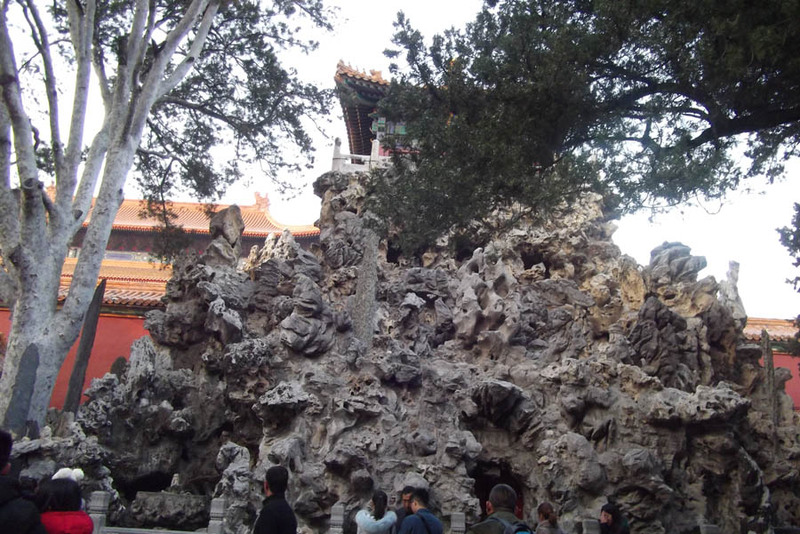 We walked quite a distance to the bus, past the moat surrounding the Forbidden City, past the ‘maybe laters’ with their fake Rolex, past street vendors selling red sticky things on sticks, to a street corner where the bus driver hastened us aboard. As we climbed on, we were serenaded by an old couple busking with a traditional stringed instrument, almost like a farewell to China. You certainly cover a lot of ground on an RSD trip, and face some interesting challenges! As an independent traveller, I find them invaluable for getting to know somewhere I’d struggle to make my own arrangements to visit. Linda and I had already been on their tour of Turkey, and we may yet follow through on our independent plans to spend a week visiting Troy and the hot spas in more detail, if the political situation improves there. In China, almost everywhere we went could do with another, longer visit. 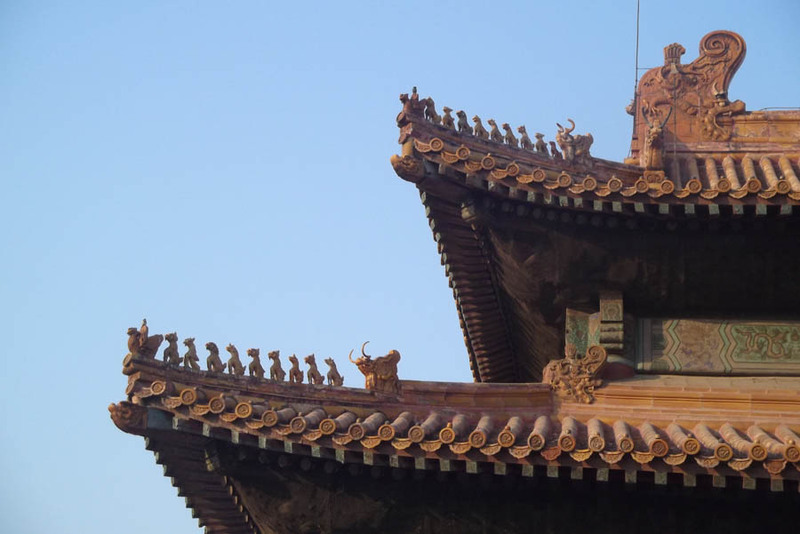 Our favourites would be a week in Shanghai, another river cruise, and a whole day in the Forbidden City. A Great Wall hike sounds lovely, as long as it’s warmer, and we’d like to spend some time in the South too. We felt a bit nervous about this adventure, and most of the time were probably well out of our depth. Our tour guide, Kevin, shepherded us around diligently though, despite the British tendency to irrational overconfidence in a totally strange country. We always feel that being polite gets you a long way, and this does appear to be true in China. It ‘d be quite hard to make any but the simplest travel arrangements yourself. You have to give the addresses you plan to stay at on your visa application form, and may have to make bookings on the phone with someone who doesn’t understand English very well. However, the resilient traveller loves a challenge!